Haymarket Medical Center welcomed baby boy Lucas Joseph Puzder as hospital system’s the first baby born in 2019. Lucas has a big sister, two-year-old Haley. The family lives in Bristow, Virginia. 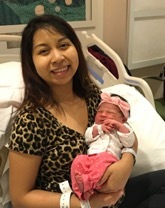 Later in the evening on January 1, baby girl Makenzie Leilani Bravo-Lopez was the first baby born in 2019 to Culpeper Medical Center. She was made her debut at the Family Birth Center at Novant Health UVA Health System Culpeper Medical Center. Makenzie has one sibling, a one-year-old brother. The family resides in Culpeper, Virginia.